Last year in March 2010 we published a blog titled “Gunmen, Fish and Puntland: the Professionalization of Piracy?“ outlining the findings of the UN Monitoring Group on Somali piracy (Report of the UN Monitoring Group on Somalia, S/2010/91 (10 March 2010)). Its results were that pirates are indeed becoming more professional by adapting their tactic and by corrupting local authorities and regional administrations. Last week the UN Monitoring Group published its new report. Covering security related events and development in Somalia and Eritrea in 2010/2011 (its mandate started in March 2010) it again contains some very interesting insights into piracy. In fact the report is the most recent and most consistent official piece of information on that issue. So what does it say (and not say) about Somali piracy? How has piracy developed in the course of the last year? Some notes before we go into the details of the report. It is notable that piracy seems to be an increasingly important issue for the Monitoring Group. Piracy is dealt with under the section “Acts that threaten the peace, security and stability of Somalia” (although the report leaves open how specifically piracy impacts on local communities and the security situation in Somalia), alongside the activities of militant Islamist and terrorist organization al-Shabab. It is further divided into sections on “Tactics, techniques and Procedures”, “Pirate Negotiators”, “Pirate arms and ammunition” and “Piracy networks”. Information were gathered from local sources as well as from international organizations, naval forces, state official, the shipping industry and crew members. As previously the report also names specific piracy locations, groups and important individuals in the business, including the hijackings they were involved in. Different case studies in the annex highlight its findings. Overall the report confirms previous assessments saying that pirates continue to adapt to counter piracy strategies and that they expand their operational and organizational capabilities. In 2010 the International Maritime Bureau recorded 219 piracy attacks and 49 successful hijackings. The average amount of ransom paid by ship owners has increased to $4,26 Million per ship, generating $102 Million revenues in 2010 (p.35, footnote 75). Somali pirates still operate according to their time-tested modus operandi as outlined in previous reports by the Monitoring Group. Nevertheless naval efforts and shipping security measures have forced them to adapt and to fine-tune their strategies and techniques. Pirates have expanded the scope and scale of their activities through the use of mother ships, which enable them to stay out on the sea for an extended period of time and to avoid the heavily protected waters off Somalia. Previously mother ships were usually small whalers and dhows. Since 2010 however large merchant vessels are increasingly used, a practice that “exploded” in In late 2010 (p.34). 19 merchant vessels have so far been used as mother ships. Hence the operational capacities of pirates have increased dramatically and enable them to strike at an even greater distance from the shore, including the Red Sea and the wider Indian Ocean, an area too large as that it could be monitored effectively (or avoided by merchant vessels) (p.33). During a piracy mission weapons and other piracy equipment are concealed from helicopters and reconnaissance flights. When boarding is imminent pirates throw suspicious stuff overboard. They thus often avoid arrest and prosecution. Reports about advanced technologies however seem to be exaggerated, though Standard Garmin Global Positioning Systems are widely used to determine locations and travel routes (pp.34-35). Nevertheless, using merchant vessels as mother ships also raises costs (more fuel, food, etc. ), leading to increasing ransom demands that further complicate ransom negotiations. Moreover, large merchant ships can be spotted more easily by coalition forces. The Monitoring Group thus expects that pirates will again shift back to using smaller skiffs and whalers as mother ships (p.34). Some groups have already started to improve small skiffs with additional fuel tanks, motors, storage space and even light or heavy machine guns to strike with more speed and at greater distance from the shore (pp.33-35). Moreover the report emphasizes that pirates usually do not harm their hostages as suggested recently (see for instance the Oceans Beyond Piracy Report on ‘The Human Cost of Somali Piracy’). In fact, there “is no evidence that the use of violence against or mistreatment of hostages by Somali pirates has either escalated or become more widespread in 2010 than in previous years” (p.35). Also the organizational practices of pirates have been further developed. Pirates are still organized as loosely structured networks. However cooperation between the two principle piracy networks in South-Central Somalia and in Puntland has been strengthened. They have established a joint base in Gradacad (though it has already been abandoned) and some of their elements have reportedly even merged (p.38). Their financing model, as outlined in Annex 4.3, has also become more sophisticated. Managed by a central committee, it includes several investors, suppliers and foot soldiers, each receiving a predetermined share of ransom payments. Supplies, especially Khat, are often bought on credit for up to 300% of the usual amount. Many investors also serve as suppliers thus making additional profit (pp.228-229). Also professional ransom negotiators have emerged and play a central role in the piracy business. They are usually not members of a piracy group but act as freelance consultants receiving twice as much as a piracy guard (those who guard the ship during the negotiations). They master English and many studied abroad, have family in the diaspora and frequently travel oversea (p.224). The profession is concentrated in the hands of a few individuals who have further improved their skills in the course of 2010. “Some 14 pirate negotiators are negotiating the release of 25 merchant ships, trawlers and a sailingyacht in exchange for millions of dollars” (p-35); one negotiator handled up to 5 hijackings at a time. Over the years some successful negotiators have also become investors. Also local events and developments in Somalia had have an impact on piracy. Though these developments seem to be more complicated and contradictory. It has previously been suggested that pirates are deeply embedded in local governance structures and communities. This trend seems to have continued. 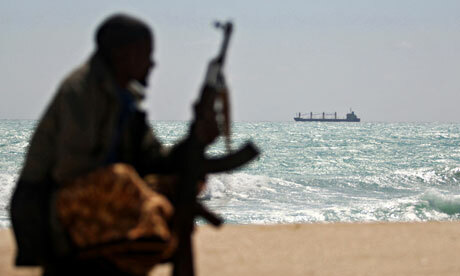 Piracy has spread and pirate operations are currently launched from all along the Somali coast (excluding Somaliland). Pirates still corrupt and infiltrate regional authorities and even al-Shabab, which had previously resisted piracy, has started to cooperate with pirates and receives a share from ransom payments. However the Monitoring Group suggests that such cooperation is still very local and limited to the port of Xaradheere (also spelled Haradheere), although it also notes that “Al-Shabaab’s growing ambivalence with respect to piracy is a disturbing trend that suggests closer, more structured cooperation between the two groups cannot be ruled out in the future” (p.39). On the other hand the report notes that local pressure on pirates is increasing and that local communities are turning against them. After negotiations with local communities and authorities (including the regional administrations of Puntland and Galmudug State), pirates have left many of their former bases in Hobyo, Garacad, Eyl and elsewhere to establish new operational centers in smaller villages and ports (p.40). The Monitoring Group does not provide any details about such efforts (for those interested in the local impact of piracy and local counter-piracy efforts we recommend the news reports on www.somaliareport.com). Interestingly, while the 2010 report warned that Puntland may become a pirate state, the Monitoring Group now indicates that its authorities have taken a tougher stance against piracy. Some well know pirates and investors have been arrested, prosecuted and jailed. It also notes that cooperation with the Puntland government has improved. Many pirates however are still living in Puntland, often even in the capital Garowe. It also happens that suspected pirates are released without any reason. The Monitoring Group therefore advises that “Puntland’s commitment to fighting piracy merits close monitoring and sustained pressure” (p.39). Summarizing these developments, the group concludes “though the territorial space for pirate anchorages has been shrinking, engagement in piracy has expanded dramatically” (p.38). So what do these findings tell us? Above all they clearly indicate that there is no end in sight and that piracy is likely to continue in the near future. As noted in their previous reports, pirates are able to adapt and to expand their activities despite sustained onshore and offshore pressure. They do so by changing and fine-tuning their time-tested strategies and techniques to avoid disruption and arrest at sea and to overcome shipping security measures (e.g. through the use of mother ships); and also in Somalia pirates are trying to rearrange themselves with local communities and governance structures to respond to local dissatisfaction (e.g. by leaving their previous bases, corrupting officials and cooperating with Al-Shabab); meanwhile, their flexible business model strengthens cooperation between piracy networks. It allows them to finance even more piracy ventures and to better handle ransom negotiations (e.g. professional negotiators and flexible finance structures). It will be seen how far pirates are able to continue to respond successfully to future challenges. Indeed, as the evidences of the Monitoring Group suggest, local, international and shipping efforts have an impact on piracy and might even change the game. But it is unlikely that one of them alone will do the job of putting an end to Somali piracy. More cooperation and coordination between different stakeholders, also in Somalia, is clearly needed.